Around 64,000 people die every year in Korea due to cancer. More than 100,000 people in Korea are diagnosed with cancer annually. Since 1983, the World Health Organization put cancer as the leading cause of death in Korea. In 1989, the Korean government started planning initiatives such as the National Cancer Center or NCC to decrease the cancer mortality rate by the year 2015 using various programs and through combined efforts with other cancer control institutions around the globe. Tumors in the spine are among the hardest to treat because they move while a patient is breathing. Other radiation therapies can therefore not prove beneficial in this regard, as it may damage other surrounding tissues. 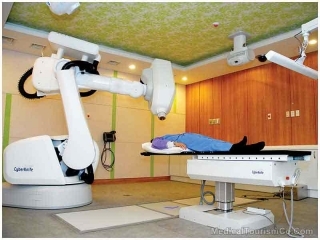 Cyberknife is more accurate in pin-pointing the exact location of a tumor, directly high-intensity radiation beams into the tumor without damaging surrounding tissues and other structures within the spine, all of which are very critical. It is non-invasive and does not require surgery, no cutting of skin or tissues are involved. Because of the accuracy with which the tumor is attacked, the treatment period is lessened considerably. Cyberknife treatments for spine cancer are done on an outpatient basis in 5 days or less, without spending the night at the hospital. There is quick recovery time and the side effects are very minimal.